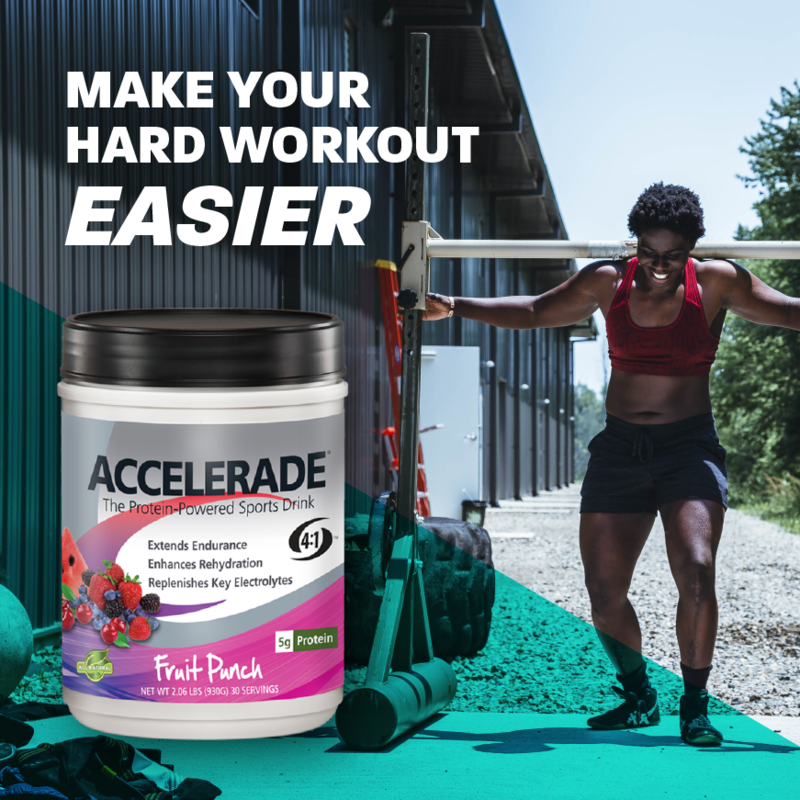 Accelerade makes a hard workout easier. The introduction of Accelerade represented an important new chapter in the science of fueling and hydration. 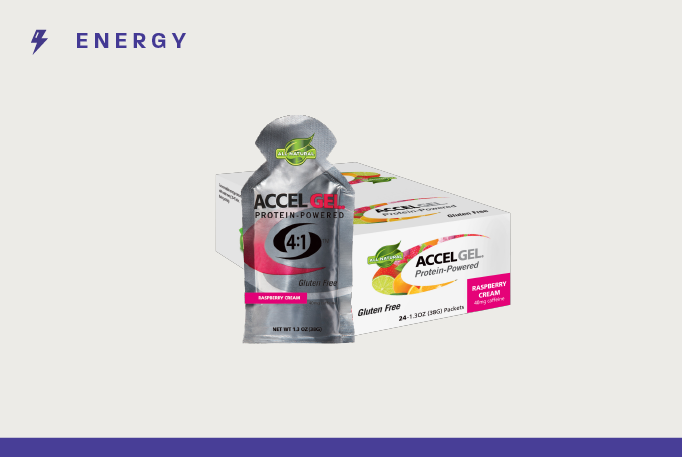 Accelerade is the first sports drink that contains protein in a patented 4:1 carbohydrate-protein ratio. 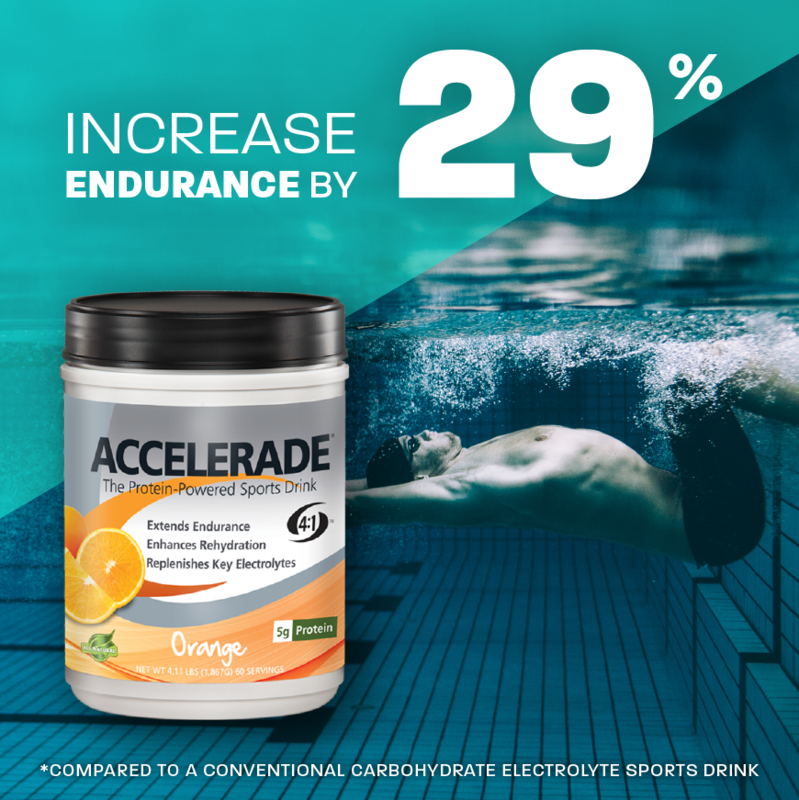 Protein-powered Accelerade in multiple studies was shown to have both synergistic effects with both carbohydrates and electrolytes as well as independent effects to enhance endurance and reduce fatigue. The carbohydrate composition found in Accelerade is different, consisting of 3 short-acting high-glycemic carbohydrates. Each of the carbohydrates uses a different transporter system, thereby increasing the amount of energy that is transported to muscles. And since the sugars are high-glycemic, energy delivery is not delayed by stomach absorption which means faster delivery. 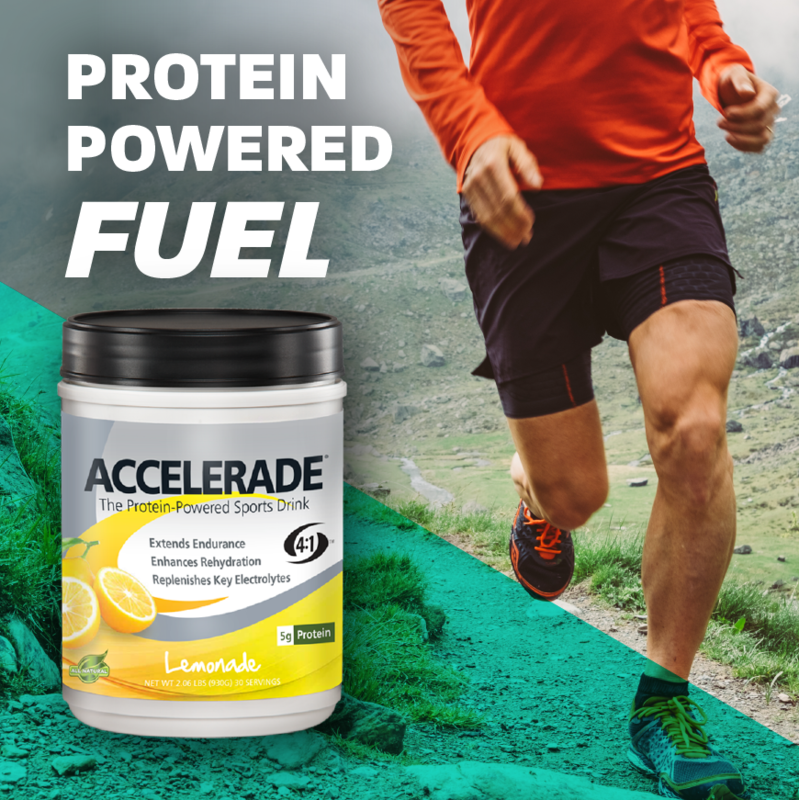 The protein in Accelerade, which contains a high percentage of branched chain amino acids reduces fatigue during exercise and also has a major impact on reducing muscle damage and speeding recovery after exercise. 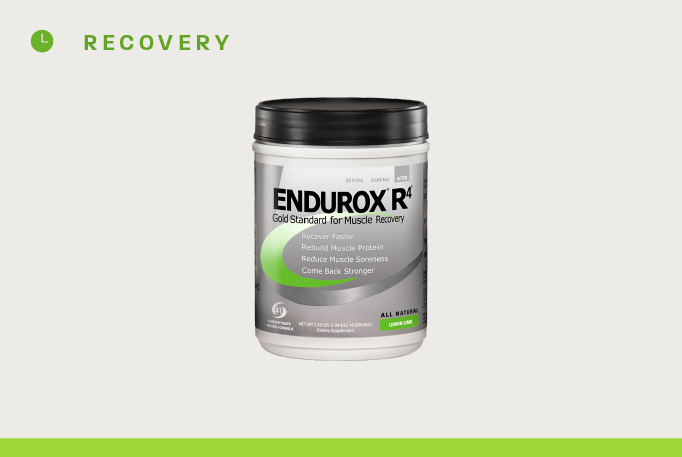 Although these endurance and recovery benefits would make protein-powered Accelerade an ideal choice for a sports drink. Accelerade is also a better rehydration drink. Just as carbohydrate activates an independent transporter system, so does protein. 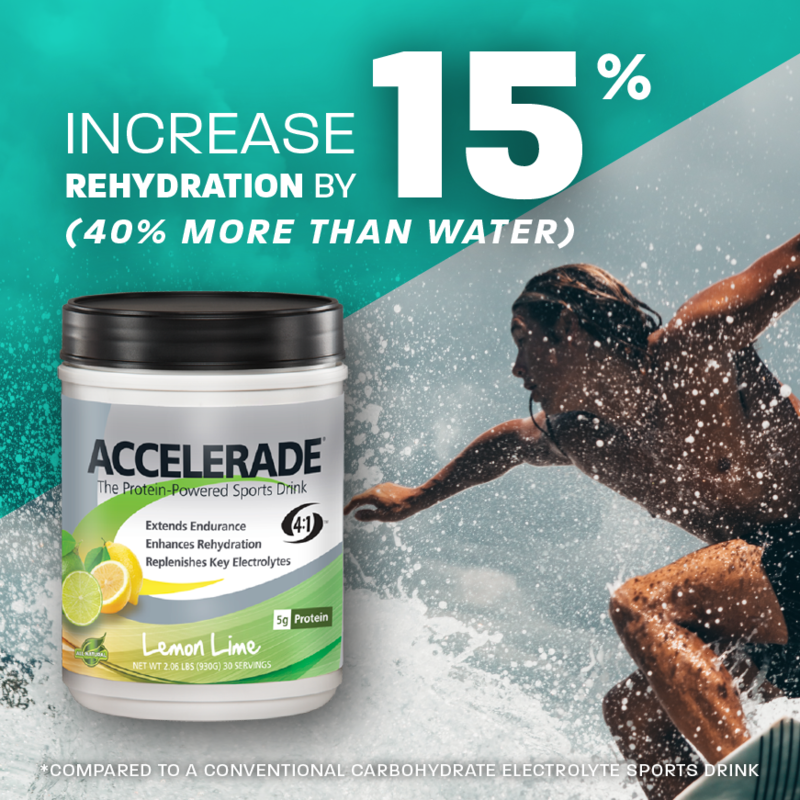 In fact, in a study comparing Accelerade to a carbohydrate-electrolyte sports drink, and to water, Accelerade was 15% more effective than Gatorade, and 37% more effective than water. 1. Protein Added to a Sports Drink Improves Fluid Retention, Seifert JG, Harmon J, DeClercq P. International Journal of Sports Nutrition and Exercise Metabolism 16: 420-429, 2006. This study concluded that "contrary to popular misconception, adding protein to a carbohydrate-based sports drink ... led to improved water retention by 15 % over [a carbohydrate-only sports drink] and 40 % over plain water." Cyclists exercised until they lost 2 % of their body weight (through sweating) and then drank either a carbohydrate-protein sports drink (Accelerade), a carbohydrate-only sports drink (Gatorade®), or water. Over the next three hours, measurements were taken to determine how much of each beverage was retained in the body (versus the amount lost through urination). The carbohydrate-protein sports drink was found to rehydrate the athletes 15% better than the carbohydrate-only sports drink and 40 % better than water. All three drinks emptied from the stomach and were absorbed through the intestine at the same rate. In addition, there was no difference between the carbohydrate-protein drink and the carbohydrate-only drink in terms of effects on blood plasma volume. 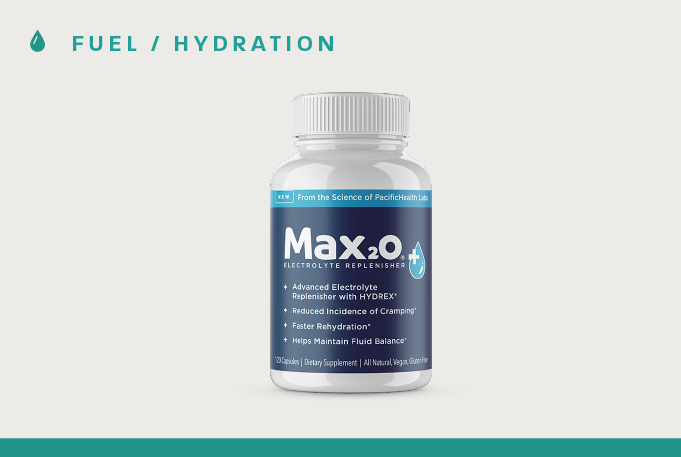 This suggests that the carbohydrate-protein drink resulted in increased water retention within and between cells. Therefore a carbohydrate-protein sports drink may be a preferable choice, over plain water and a carbohydrate-electrolyte sports drink, when rehydration and fluid retention are a concern. 2. Effects of a Carbohydrate-Protein Beverage on Cycling Endurance and Muscle Damage, Saunders MJ, Kane MD, Todd MK. Medicine & Science in Sports & Exercise. Jul;36(7):1233-8, 2004. This study demonstrated that "a carbohydrate beverage with additional protein calories produced significant improvements in time to fatigue and reductions in muscle damage in endurance athletes" compared to a carbohydrate-only beverage. Fifteen male cyclists rode stationary bicycles to exhaustion while drinking either a carbohydrate-protein sports drink (Accelerade) or a conventional carbohydrate sports drink (Gatorade). The following day, the cyclists completed a second ride to exhaustion at a higher intensity. The athletes were able to ride 29 % longer in the first workout and 40 % longer in the second workout when given the carbohydrate-protein drink than when given Gatorade. Blood samples were taken from the cyclists and tested for signs of muscle damage (CPK). The results revealed that the carbohydrate-protein sports drink reduced muscle damage by 83 % compared to the conventional carbohydrate sports drink. 3. Effects of a Carbohydrate-Protein Supplement on Endurance Performance During Exercise of Varying Intensity, Ivy JL, Res P, Sprague RC, Widzer MO.International Journal of Sports Nutrition and Exercise Metabolism. Sep;13(3):388-401, 2003. 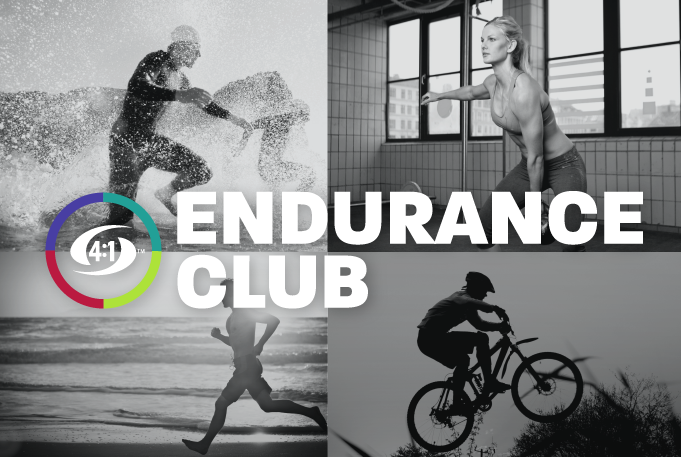 This study demonstrated that "the addition of protein to a carbohydrate supplement enhanced aerobic endurance performance above that which occurred with carbohydrate alone." Trained cyclists exercised at various intensities for three hours, then they cycled at high intensity until they were exhausted. Every 20 minutes they drank either a carbohydrate-protein sports drink (Accelerade), a carbohydrate-only sports drink, or water. The carbohydrate-protein sports drink increased the amount of time the cyclists were able to continue pedaling by 36 % compared to the carbohydrate-only sports drink and by 55 % compared to water. 4. Carbohydrate-Protein Beverage Improves Muscle Damage and Function Versus Isocarbohydrate and Isocaloric Carbohydrate-Only Beverages, St. Laurent, T.J., Todd, M.K., Saunders, M.J., Rudy Valentine, R.J., and Flohr, J.A. Medicine & Science in Sports & Exercise. 38(5):S340, 2006. This study showed that "a carbohydrate-protein beverage consumed during exercise attenuates post-exercise muscle damage, and improves subsequent muscle functioning compared to a placebo, or carbohydrate beverages matched for either carbohydrate or total calories." Twelve male cyclists performed four rides to exhaustion on a cycle ergometer. During the trials, subjects consumed 250 mL of either a carbohydrate-protein sports drink (Accelerade), a carbohydrate-only beverage with the same number of total calories as Accelerade, a carbohydrate-only beverage with the same amount of carbohydrate as Accelerade but fewer calories, or a non-caloric flavored placebo every 15 minutes. Exercise sessions were repeated every five to 10 days until each cyclist had used each of the four beverages. Measurements of muscle damage biomarkers (CPK and LDH) were taken before and after cycling. In addition, post-exercise muscle function was assessed one day post-exercise by recording the maximum number of leg extensions each subject could perform. 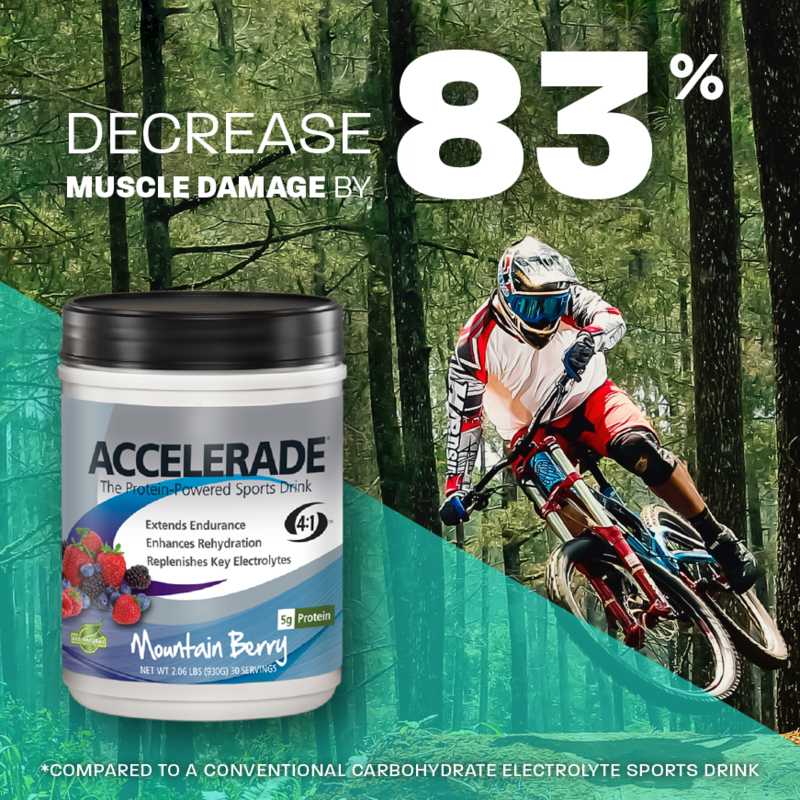 On average, cyclists exhibited significantly lower levels of muscle damage markers and were able to perform significantly more leg extensions after riding with Accelerade than with any of the other beverages. This study concluded that "combined data from three studies revealed significant improvements in performance ... with [carbohydrate-protein] versus [carbohydrate-only] supplementation." Heart rate (HR), rating of perceived exertion (RPE), and lactate were lower in the carbohydrate-protein trials, and "decreases in HR and RPE were associated with improvements in performance." Data from previous studies showing a 19 % average improvement in endurance performance with a carbohydrate-protein beverage (Accelerade) compared to a carbohydrate-only beverage were reexamined to determine if the improvement was related to any physiological variables that were measured. The analysis revealed that heart rate, perceived exertion, and blood lactate levels were lower in the carbohydrate-protein trials, although only decreases in heart rate and perceived exertion were associated with improvements in performance. 6. Comparison of Responses to Exercise When Consuming Carbohydrate and Carbohydrate/Protein Beverages Valentine, R.J., St. Laurent, T.J., Saunders, M.J., M. Todd, M.K., and Flohr, J.A. Medicine & Science in Sports & Exercise. 38(5):S341, 2006. This study found that "a [carbohydrate-protein] beverage consumed during exercise reduced lactate accumulation and perceived exertion compared to [carbohydrate-only] beverages ... and that "there are metabolic and performance advantages of [carbohydrate-protein] beverages over [carbohydrate-only beverages matched for either total calories or carbohydrate]." Ten male cyclists completed prolonged bouts of stationary cycling while consuming 250 mL of either a carbohydrate-protein beverage (Accelerade), a carbohydrate-only beverage with the same number of total calories as Accelerade or a carbohydrate-only beverage with the same amount of carbohydrate as Accelerade but fewer calories. The test was repeated every five to 10 days until all of the subjects had used all three beverages. Metabolic measures were assessed following 30 minutes of exercise. Blood lactate levels and heart rate were significantly lower in the Accelerade trial than in either of the carbohydrate-only beverage trials. This study found that "muscle recovery ... was enhanced with the ingestion of a [carbohydrate-protein] recovery beverage compared to a [carbohydrate-only] recovery beverage." Twenty-three NCAA Division I cross-country runners completed traditional in-season training for six days. Immediately following each training session, subjects ingested either a carbohydrate-protein beverage (Accelerade) or a carbohydrate-only beverage. Following a 21-day washout period, subjects repeated the same protocol as above, receiving the alternate beverage. Measurements of muscle damage (CPK) and muscle soreness were obtained before and after each trial. Compared to the carbohydrate-only, Accelerade reduced muscle damage by an average of 27 % and muscle soreness by 30 % in the runners. 8. The Influence of a Carbohydrate/Protein Sports Drink on Soccer Sprint Performance: Kipp R, Seifert JG, Burke ER., European College of Sports Medicine, Salzburg, Austria. Müller, Schwameder, Zallinger, Fasternbauer, eds. P12V-02, p 451, 2003. This study showed that a carbohydrate-protein sports drink (Accelerade) improves sprinting speed at the end of a long soccer training session compared to a sports drink containing only electrolytes. Following an intense soccer workout of 75 minutes, subjects participated in four speed trials with five minutes of rest after each sprint. Half the players drank the carbohydrate-protein drink while the other half drank an electrolyte-only drink. The carbohydrate-protein group actually improved their speed by 1.1 seconds between the first and last sprints, while the other group slowed down by 2.2 seconds. 9. The Effects of a Carbohydrate/Protein Drink on Skating Performance in Collegiate Hockey Players: Olson B, Seifert J. Medicine & Science in Sports & Exercise. 36(5):S13, 2004. This study proved that "performance in high intensity, short duration activities can be enhanced with a [carbohydrate-protein sports drink]." The subjects were five collegiate male hockey players (one goalie and four skaters). Skaters ingested either a carbohydrate-protein sports drink (Accelerade) or a non-caloric placebo during two 90-minute practice days. Treatments were then switched for the following week. Shooting was assessed in skaters by shooting 25 pucks at targets at three-second intervals. Skating performance was measured by a time-to-complete task as players weaved through six cones while handling the puck. The goalie completed a skating drill of 10.5m and then an auditory/hand reaction time test using both hands. Performances were tested after practice on the second day. Speed performance improved by eight percent and reaction time improved by 12 % in the carbohydrate-protein sports drink treatment. 10. Muscle Damage, Hydration and Energy Supplementation During Recreational Alpine Skiing: Seifert JG, Kipp RW, Amann M, Gazal O. International Journal of Sports Nutrition and Exercise Metabolism 15: 528-536, 2005. This study demonstrated that "ingestion of a carbohydrate-protein beverage minimized muscle damage indices during skiing compared to placebo and no fluid." Thirty-one recreational skiers were separated into three groups. All three groups skied 12 runs, which took about three hours. One group drank nothing. A second group drank 6 ounces of a placebo (flavored water) after every second run. A third group drank an equal amount of the carbohydrate-protein sports drink (Accelerade). After the 12th run, blood samples were taken from each skier and analyzed for two biomarkers of muscle stress (myoglobin and creatine kinase). Subjects that received the carbohydrate-protein sports drink showed no signs of muscle damage, while indicators of muscle damage increased by 49% in subjects receiving only water. 11. Gastric Emptying Characteristics of Carbohydrate/Protein and Carbohydrate Only Sports Drinks During Moderate-Intensity Exercise: Seifert, John G.; Schapman, John; Little, Tanya J.; Robins, Anna; Thompson, David G.; Portman, Robert. Medicine & Science in Sports & Exercise: May 2009 - Volume 41 - Issue 5 - p 192. Previous research has shown that a carbohydrate-protein sports drink (CHOP) improves rehydration after exercise compared to a carbohydrate-only sports drink (CHO). However, little is known about how composition of sports drinks impacts gastric emptying during exercise. Numerous gastric empting studies have been limited to sampling only pre- and post-exercise. This study was completed by sampling 13CO2 at regular intervals during exercise to assess gastric emptying rate during exercise. The results of the present study indicate that a CHOP sports drink has similar gastric emptying characteristics during exercise to those of a CHO sports drink. 12. The Effect of Carbohydrate and Protein Supplement on Resistance Exercise Performance: Baty, J.J., Hwang, H., Ding, S., Bernard, J.R., Wang, B., Kwon, B., Ivy, J. Journal of Strength and Conditioning Research, 21(2), 321-329, 2007. The purpose of this study was to determine whether resistance exercise performance and post-exercise muscle damage are altered when a CHO-PRO supplement is consumed. Thirty-four male subjects (age 21.5 + 1.7 years; height 177.3 + 1.1cm; weight 77.2kg + 2.2kg) completed 3 sets of 8 repetitions of seven exercises at their 8-repetition maximum for each to volitional fatigue. The exercise order consisted of the high pull, leg curl, standing overhead press, leg extension, lat pull-down, leg press, and bench press. In a double-blind, post-test-only control group, subjects consumed 355ml of either Accelerade or placebo (electrolyte and artificial sweetener beverage) 30 minutes prior to exercise, 177 ml immediately prior to exercise, 177 ml halfway through the exercise bout, and 355 ml immediately following the exercise bout. Cortisol, insulin, myoglobin, and creatine kinase levels were then respectively analyzed. The use of Accelerade decreased the myoglobin and creatine kinase response in the subjects, suggesting reduced muscle damage and reduced soreness. The results of this study indicate that “the use of a CHO-PRO supplement (Accelerade) during resistance training reduces muscle damage and soreness”. 13. Ingestion of a Carbohydrate-Protein Supplement Improves Performance During Repeated Bouts of High Intensity Cycling: Harmon JH, Burckhard JR, Seifert JG. Medicine & Science in Sports & Exercise. 39(5):S363, 2007. The purpose of this study was to determine whether a supplement with a carbohydrate-protein ratio of 4:1 would significantly improve sprint time in repeated bouts of high-intensity cycling compared to placebo. Seventeen subjects completed a series of 4 x 2 km time trials on a cycle ergometer at a load corresponding to their lactate threshold. 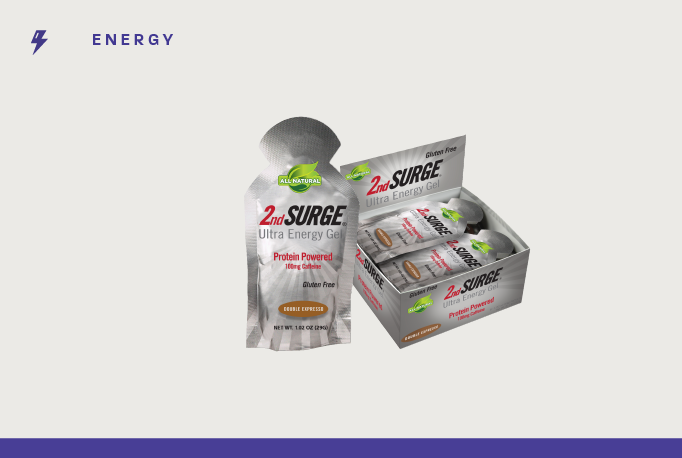 They ingested 354 ml of either Accelerade® or a flavored placebo 15 minutes prior to their first sprint, 472 ml after the second sprint, and 295 ml after the second and third sprint. A 60-minute rest interval was provided after the first sprint, while 30 minutes separated the remaining sprints. In the Accelerade® treatment the average finishing time was 177 +/- 12.1 seconds while the placebo group finished with an average time of 181 +/- 10.5 seconds. Additionally, the last sprint was statistically faster for Accelerade vs. placebo. In the Accelerade trial subjects slowed by 2.4 seconds from the 1st to the 4th sprint, whereas sprint time slowed by 6.8 seconds from the 1st to the 4th sprint for placebo. 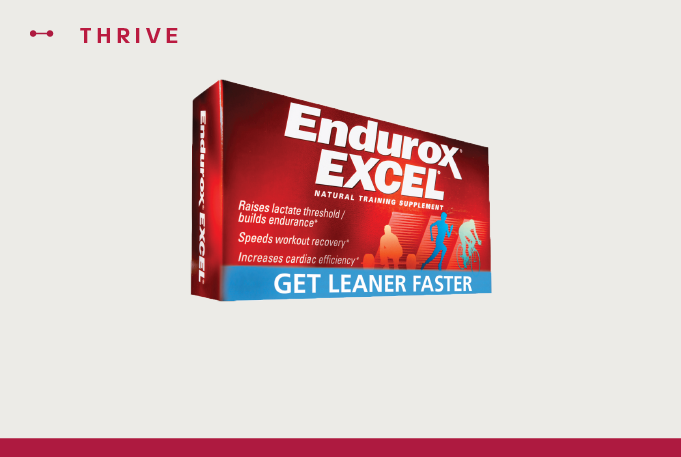 Blood glucose was greater (p<0.05) for Accelerade® than placebo before and after the 3rd and 4th sprints. The 4.4-second time differential translates to approximately 50 meters in distance. The results of this study indicate that "sprint performance is significantly improved when a carbohydrate/ protein supplement is ingested during repeated bouts of short-duration, high-intensity cycling." 14. Attenuated CPK Following Carbohydrate/Protein Intervention Improves Subsequent Performance: Combest TM, Saunders MJ, Kane MD, et al. Medicine & Science in Sports & Exercise. 37(5), 2005. This study involving cyclists found that "post-exercise muscle damage was notably attenuated by [carbohydrate-protein] beverage administration in the majority of cyclists, and that "Cyclists who experienced large reductions in [muscle damage] following [carbohydrate-protein] treatments performed significantly better during subsequent exercise than non-responders." Fourteen recreationally competitive male cyclists rode stationary bikes to exhaustion. Subjects consumed either a carbohydrate-only sports drink or carbohydrate-protein sports drink (Accelerade) every 15 minutes of exercise, and within 30 minutes of exercise completion. Fifteen hours later, subjects had blood samples taken to assess plasma CPK levels (a marker of muscle damage), and then performed a second ride to exhaustion. The majority of subjects experienced large attenuations in CPK during the carbohydrate-protein trial versus the carbohydrate-only trial. The remaining five cyclists were "non-responders." To determine whether differences in post-exercise CPK responses influenced subsequent cycling endurance, performance was compared between the two groups during the second ride using a dependent t-test. The difference in time to exhaustion was significantly larger (p<.05) in the responder group than the non-responder group." 15. Influence of Carbohydrate-Protein Beverage on Cycling Endurance: Saunders MJ, Kane MD, Todd MK. American College of Sports Medicine. 1233-1238, 2004. This study demonstrated that improvements in markers of muscle disruption seen with carb-protein ingestion are independent both of total calories and carbohydrate content. Cyclists completed 4 rides to exhaustion consuming either a placebo, 7.75% carb beverage, 9.69% carb beverage or a 4 to 1 carb-protein combination. Two principle indicators of muscle damage, creatine kinase and myoglobin were measured. Subjects receving the carb-protein drink has significant lower creatine kinase and myoglobin levels than seen with the other three treatment. Reduction in muscle damage appeared to translate into greater muscle performance 24 hours later. I have used EDUROX R4, ACCELERADE and EDUROX EXCEL for more than 10 years. I have been in Law Enforcement for 23 years and this is the first product that has helped me in my profession. I started it to help me prepare for the physical agility required to join a SWAT team and felt amazing results making it so much easier to prepare. I continued to use it for my workout routines and then used to to prepare for the US Border Patrol Academy at age 36. I competed the academy competing with a younger crowd with such ease and felt great. My endurance kept improving and I never suffered a migraine headache throughout the academy which I have always suffered from since I was a child. I continue to use all three products to help me at work with the long and hot walks wearing full gear in the Laredo, TX heat. I am 45 years old right now and feel better than I did when I was younger. 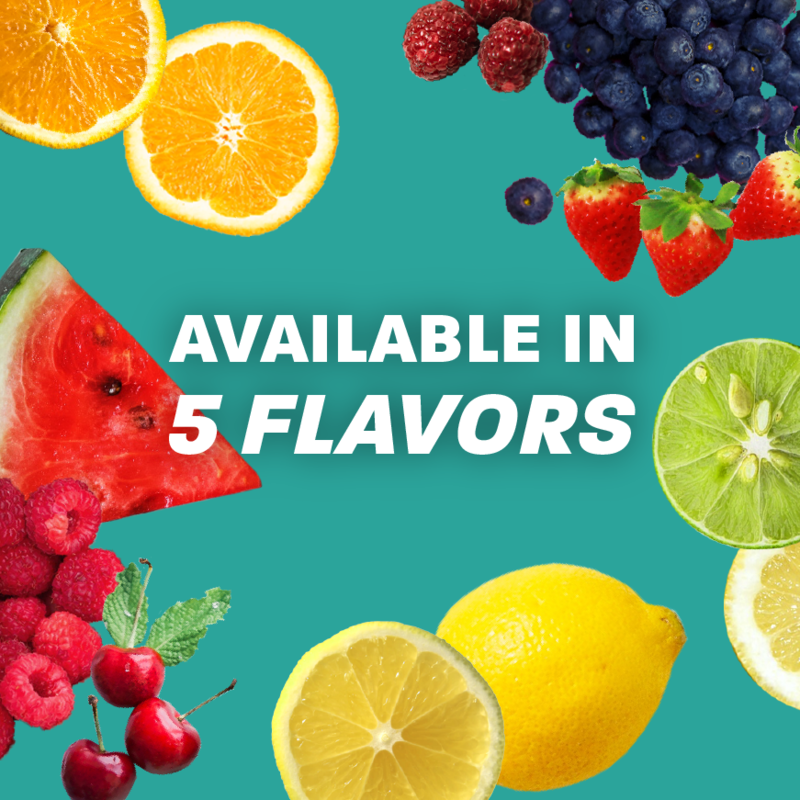 I have tried Lemon Lime, Tangy Orange but my favorite is Fruit Punch. I just wish they had this when I was younger. Prior to my injuries and surgeries I used Accelerade and loved it. Now that I'm (hopefully) healthy and back in training there was no doubt I would use it again. The Mountain Berry didn't disappoint - gave me the extra boost needed during my long (20 + mile) "runs". Just remember to shake it vigorously upon initial mixture and before drinking. Thanks to Tim Cassidy of PacificHealth Labs for all his help and quick responses to my questions. You rock Tim! I am a professional swimmer and I have always loved the pacific health lab line of products since a friend of mine introduced me to them back in college. I feel the difference when I fuel my body with them and couldn't imagine myself training to full potential without them. I am training for my first marathon and didn't think the fueling gels and chews I have used for half marathons would work for me (and my stomach). I ordered the sample pack of gels and accelerade. The gels are super easy to take while running, taste good, help maintain energy on my long runs and no digestive issues!! Love the fruit punch accelerade also. Order more for the rest of my training. This is my go-to sports drink. I need the calories for my training, especially on long training rides. Since there is also protein, I know it is helping me with my muscle breakdown repair and growth. I was drinking fruit punch flavor before, but I prefer this Mountain Berry flavor instead! Great product. I really like this product. It is great for pre-run or post-run. I haven't tried it during yet. Works great tastes great. Gives you that protien othersl eave out. I'm very picky about protein powder taste and this one is a good one. Has a good lemon lime flavor. Don't think it tastes like Gatorade lemon lime, but a fairly close copy. Mixes well, no huge, slow to disappear bubbles. Works great in a shaker bottle. I will be making this my standard protein powder.